To support its Danish members CS and HKKF, EUROMIL issued the following statement. The European Organisation of Military Associations (EUROMIL) fully supports your struggle for fair wages in the public sector as a whole, and in the military in particular. EUROMIL is an umbrella organisation composed of 34 military associations and trade unions from 23 countries. It is the main Europe-wide forum for cooperation among professional military associations on issues of common concern. EUROMIL strives to secure and advance the human rights, fundamental freedoms and socio-professional interests of military personnel of all ranks in Europe and promotes the concept of “Citizen in Uniform”. As such, a soldier is entitled to the same rights and obligations as any other citizen. EUROMIL particularly calls for recognition of the right of servicemen and -women to form and join trade unions and independent associations and for their inclusion in a regular social dialogue by the authorities. We know that both Danish military trade unions CS and HKKF play an important role in the present negotiations with the government, notably but not only through the key positions held by Flemming Vinther (Chairman of the Central Federation of State Employees’ Organisations – CFU) and Jesper Hansen (member of the bargaining committee). EUROMIL closely followed the situation in Denmark and is deeply concerned about the most recent developments, including the strike and lockout notices. The social dialogue and bargaining system in Denmark is seen as a good example for military associations and trade unions all over Europe. In a number of European countries, military personnel do not even have the right to form and join associations and trade unions. 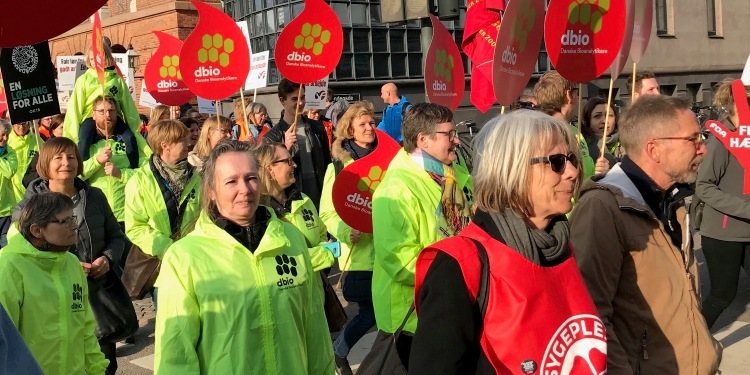 Against this background, EUROMIL is deeply worried about the worsening situation in Denmark, where the long and unsuccessful negotiations set the entire bargaining system at stake. Ensuring and improving real wages. Ensuring paid lunch break. This requirement naturally only applies to those who already have paid lunch break – not all public-sector employees. Ensuring an agreement on the teachers’ working hours. This aspect is considered as a first step enforcing efficiency improvements and innovations which will result in deteriorated pay and employment terms for large groups of public-sector employees. EUROMIL calls on all parties involved to not escalate the situation further and to respect the principles of social dialogue, through which, ultimately a satisfying solution will be found. You may rest assured that we stand by your side and fully support your position!